Georgia Power has reported that efforts to dewater its coal power plant ash ponds are well underway, marking the next step in the safe and permanent closure of 29 ash ponds at 11 active and retired power generation sites across the state of Georgia. The company’s “comprehensive and customised” dewatering process treats the water removed from the ash ponds to ensure that it meets the requirements of each plant’s wastewater discharge permits approved by the Georgia Environmental Protection Division (EPD) and is protective of applicable water quality standards. “We have invested in appropriate water treatment systems for each location to ensure that our dewatering process is protective of Georgia’s lakes and rivers”, said Aaron Mitchell, general manager of Environmental Affairs for Georgia Power. 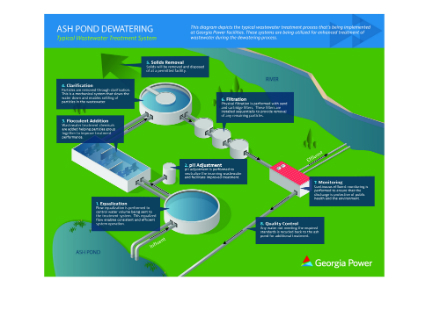 Before any ash pond is dewatered, the company provides advance notice and submits an “ash pond dewatering plan” to Georgia EPD for its approval. The plan describes the dewatering process, water treatment controls and monitoring practices that will be implemented to protect water quality at that site. Once approved by Georgia EPD, this plan is posted to Georgia Power’s website. Once the Georgia EPD approves the dewatering plan and before dewatering activities begin, Georgia Power will again provide advance notice to Georgia EPD of its intent to begin dewatering and implement the requirements of the approved dewatering plan. As part of the approved dewatering plan, ash pond water goes through a treatment system operated by a qualified independent wastewater contractor. The treatment steps may include pH adjustment, clarification, filtration and more, before being discharged. Monitoring and quality control is the final step and in place at every site. Independent contractors sample and independent accredited laboratories analyze both the discharged water from the pond, as well as water samples from the receiving lake or river, to document that treatment steps are effective and that water quality is being protected. These results are provided to Georgia EPD and posted to Georgia Power’s website. As part of its efforts to permanently close its ash ponds, Georgia Power is removing all coal ash from 17 ash ponds located adjacent to lakes or rivers and using what it describes as “advanced engineering methods and technologies” to close the remaining 12 ash ponds in place. The company says it is on track to cease operations at all its ash ponds, and complete the ongoing construction work needed to accommodate dry handling of ash at its coal-fired generation facilities, in 2019. Three ash ponds at Plants Kraft, Branch and McDonough have been completely excavated and construction activities are in progress at eight other ash ponds. In addition to protecting surface waters such as lakes and rivers through dewatering processes, the company says it is also actively monitoring groundwater quality at its facilities. Georgia Power’s groundwater monitoring program includes the following elements: about 500 groundwater monitoring wells around its 29 ash ponds and on-site landfills; collection of samples by independent third party contractors and analysis by accredited independent laboratories for 20 substances; provision of results to the Georgia EPD and posting on Georgia Power’s website. Over the last five years, Georgia Power, the largest electric subsidiary of Southern Company, has retired or fuel-switched approximately 4000 MW of coal and oil-fired generation and the company’s coal-fired generation capacity is nearly half of what it was in 2005. Approximately 50 percent of the coal ash Georgia Power produces today is recycled for various uses such as Portland cement, concrete, and cinder blocks.